Adam and Eve disobeyed God and ate from the Tree of Knowledge of Good and Evil and the law of death has been with them and their descendants ever since. Humanity falls under this law at the moment of conception but the good news is that you can choose to make Jesus your Savior and change your destiny from one of torment in the Lake of Fire to eternal life in Heaven. We are free from the curse of the law because of the work Jesus did on the cross. 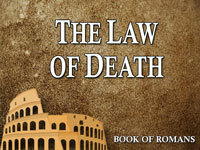 Unfortunately, many Christians confuse the law of death with the laws given to Moses. When Paul said we are no longer under the law, it means we are no longer under the law of death. Conversely, when Paul spoke of establishing the law, he was speaking about the laws of Moses. With the exception of the sacrificial law fulfilled on the cross, Jesus confirmed the remaining laws of Moses as still valid. We are liberated from the death sentenced imposed by Adam's sin because Jesus has freed us from its curse by becoming a curse on the cross in our place. God loves humanity and is not willing that any man should perish but that all should come to repentance and everlasting life.